Ffestiniog Travel are excited and delighted to offer you the opportunity to experience the beautiful Harz Narrow Gauge Railway during its popular Winter Gala in February 2013 (hopefully in the snow!). We have produced an unescorted package that allows you to explore this scenic railway network, much loved by steam enthusiasts, and the Winter Gala is a perfect time to see it in its full frosty glory. This 7-day unescorted rail holiday is based in charming Wernigerode and includes three days of excursions on the HSB steam railways with overnight stops en route in Aachen and Wuppertal. Wernigerode is the perfect base from which to board the special trains and is an ideal location to capture great photos as both freight and passenger trains will have photo stops and run pasts before departure to Hasserode. Other journeys will include travel through to Eisfelder Talmühle where the Harzquerbahn and Selketalbahn meet. 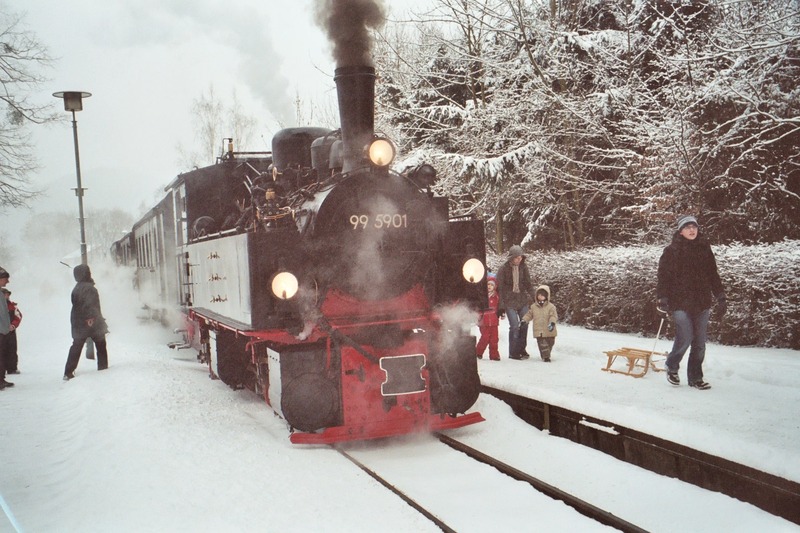 On day three of the Winter Gala 'LKM' steam locomotives first head to Hasselfeld before traversing the rest of the Selketalbahn to Quedlinburg. All these routes offer some wonderful wintry scenery in which photographic run pasts will be a pleasure! The journey home includes an overnight stop at Wuppertal offering time to explore the Rhine-Rhur area and your public transport ticket (included in the price) will provide free travel on Wuppertal’s famous suspension railway. Departing on Eurostar from St Pancras on 6 February 2013 and returning 12 February this rail trip, priced from £840pp, includes your 3-day Harz Winter Gala Program, second class rail travel to and from Wernigerode and hotel accommodation and breakfasts. So if you are considering a winter break which includes a healthy dose of railway content please see our website Harz Winter Gala for full details or contact me direct by email at dan.may@ffestiniogtravel.co.uk or telephone 01766 772030.